First of all, I would like to thank all the visitors of this blog for there support and co-operation extended and making this blog a success !!! THANKS A TON !!! I started this blog exactly an year a go… with an intention to keep notes of the things that I do, so that some time down the line, this might help. 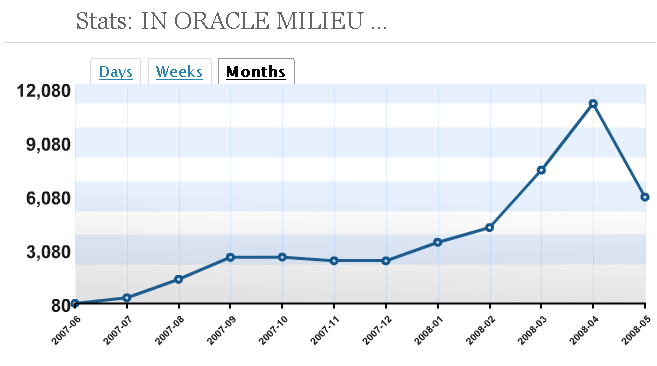 During this year, I have learned many new things, and posted many critical and general things about Oracle technology. I never limited the information to just Oracle Database, but explored other technologies of Oracle as well. I tried to provide uncommon things which one may not be able to see on any other sites. I also tried to consolidate the things which are present at different places (giving the references) so that a visitor should get everything he/she wanted at one place. Most of the steps and procedure mentioned in my post are executed by me and posted only after a successful try. Therefore all visitors can definitely trust the reliability of any post on this site. Last thing, I would like to present the statistics for this blog. In 1 year, I posted 72 Posts, 18 Pages distributed among 17 categories. Below graph shows the month wise status for the year. Thanks all again for the support and I look forward for more knowledge sharing and growth in the upcoming years. I will be posting more and more information about Oracle technology. Please let me know if you have any feedback for me. Congrats for completing one year. Good work ..